In the past, Cadillac dealers would ruin new cars by putting a nice landau top, gold badges, and white wall tires on them. But Cadillac is cool now. That means carbon fiber. That means big wheels. That means even uglier cars than you could possibly imagine, like this $60,000 ATS. This ATS, which is at Sewell Cadillac of Dallas, Texas has $14,527 in dealer installed extras. That includes such popular items as tinted windows, custom wheels and tires, and a $9,995 "custom carbon fiber wrap." Carbon fiber on a Cadillac. This is the world we live in. The most amazing charge to me is the $39.95 to fill the tires with nitrogen. You couldn't just throw that in for free, Sewell? 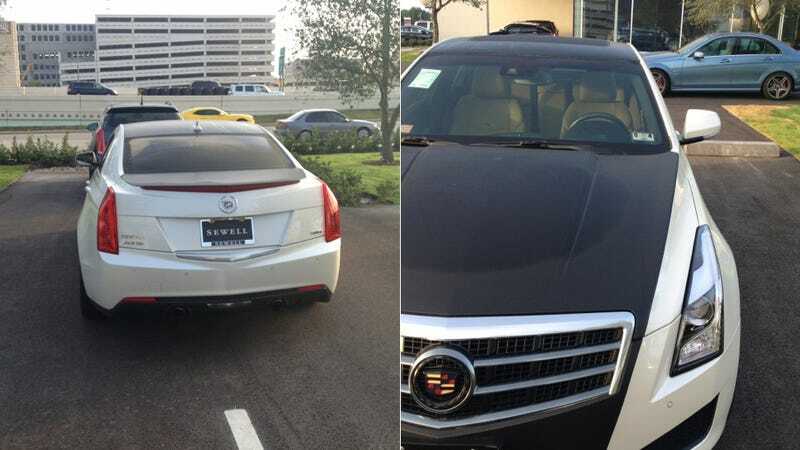 The good news is that if you have more money than brains, live in Dallas, and want a ruined Cadillac, Sewell has a fresh one just for you. Go by their conveniently located showroom today and see if there are other ways to ruin that poor ATS that haven't been spec'ed yet.